This thesis represents another small step in understanding wetlands and our influence, intentional and otherwise, upon them. 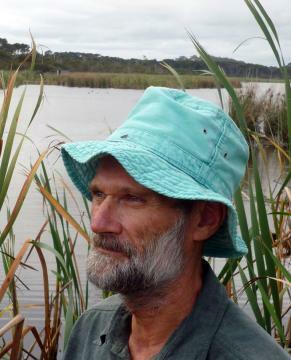 It also poses questions and problems which future researchers and managers will need to resolve if conservation and social values of Perth’s urban wetlands are to be preserved. Image above: Winter dawn, East Lake. On cold still mornings at Perry Lakes vapour is frequently visible rising from the warmer water into the cooler air. The isotopic composition of this evaporated lake water δE (‘delta E’) is a crucial component in the determination of isotopic water balances. At Perry Lakes thermally regulated evaporation pans and direct sampling and measurement of atmospheric and lake evaporate were employed to develop isotopic exchange parameters. While these could have been estimated using empirically derived general equations, the more rigorous approach was adopted in which these were experimentally determined specifically for Perry Lakes. Integrating mass, solute (chloride) and isotopic (deuterium) balances allowed the groundwater fluxes into and out of the lakes to be quantified in 146 continuous 4 day balances spanning April 1996 to January 1998. These balances and the rigorous measurement of their groundwater components represents the single most important achievement of the project. The thesis comprises 15 chapters plus appendices. The Overview should be read in conjunction with the Abstract. Each chapter, references and individual appendices are available for download in PDF format. Information regarding thesis supervision and examination is available here.